Andres Segovia. 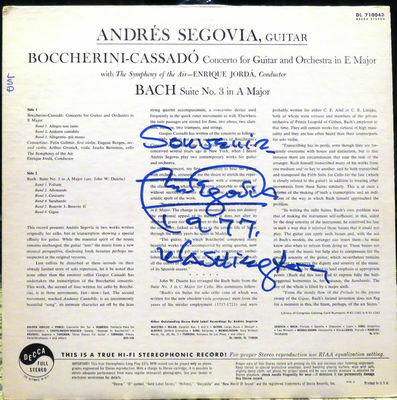 Signed autographed "Segovia" LP album. Record is excellent minus condition, cover in excellent condition - no splits on seams. Pictures are part of the description. Kept in pet and smoke free environment. Auctioning my autographed record collection; check out my other listings. Payment via PayPal. Shipped with USPS Media Mail with tracking. Lower 48. No international.